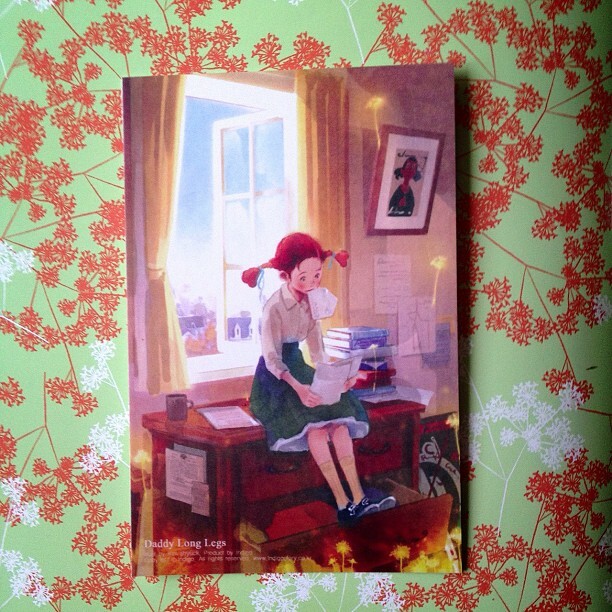 Reason I choose it: I bought a set of postcards on Yozocrafts which were of a book theme. This postcard was one of them for the book 'Daddy Long Legs' which I have never heard of and only associate with a spider that we called Daddy Long Legs as a child. I looked this book up on amazon and downloaded it. I read it within the same day having started it over my lunch. Jerusha Abbot (Judy) is an orphan who has spent her whole life in an asylum. She is good at writing so the mysterious Daddy-long-legs promises to send Jerusha to college...provided she follows his rules and writes him letters to tell him about her studies. The story is basically in the form of those letters as written by Jerusha. She writes in a very funny engaging way with the result that the Daddy-long-legs finally shows her his true identity and tells her he has fallen in love with her. I love the writing style and there was something about Jerusha that I liked in her innocence and discover of all things new. Its also nice of course that it is all written in letter form as it covers two of my hobbies in to one. The only downside was that its predictable and you know who the trustee is, I found his intentions quite disturbing and a little creepy as after all he knew who she was but she didn't know who he was. This reminds me of a book though that I read in my teens, I can't remember the name of it but it was about a girl who wrote to a professor as part of a project. It's one that's always stuck in my mind that its a shame I can't remember the title. I ended up buying the sequel to this book but I haven't read it yet. I never read the book before but when I was a child we had a japanese cartoon of it on tv and I liked it a lot. Still even as a child I found it weird that an adoptive father would then fall for his daughter.. It is weird as he didn't want to be known but then turned up in her life without disclosing who he was and trying to control what she did using the money he was giving her as an excuse. It makes you wonder if he had this intention all along to have a young educated wife as he must have been in his 40s. I guess the cartoons a little different if he adopted her in that.